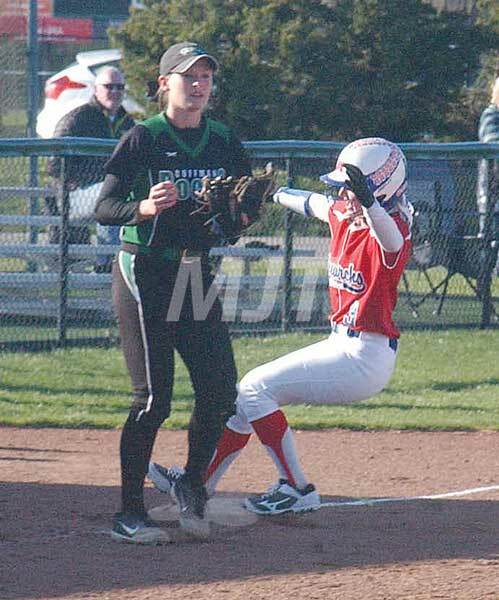 Emily Daniel of MHS reaches third base safely at Dublin Coffman on Monday. The Lady Monarchs lost, 8-7, when the Shamrocks scored the winning run in the bottom of the seventh on an error. The Lady Cats of North Union have a mission to be the best and now that can say they are. NU sits at the top of the Central Buckeye Conference Mad River Division and is tied for the lead of both divisions after beating the Lady Raiders of Benjamin Logan, 4-0, on Monday. The weather played a bit of a role as the first pitch crossed that plate with a stiff wind coming out of left field and temperatures hovering around 50 degrees. NU pitcher, Josie Duncan had to throw more than 130 pitches to notch 12 K’s. Coach Dawn Draper said weather is a part of the game when playing in early spring. “I thought the kids did really well,” she said. “Duncan had 12 K’s, which didn’t seem like that, but she worked hard and threw a lot of pitches today. “This weather change is Ohio,” said Draper. “It is a little colder and the grip is a little different. The Wildcats have had a nice run of defense lately. They gave up their last run on April 10 in a 6-1 victory over Northeastern. The Lady Cats struggle in the early frames against a solid Ben Logan pitcher who was able to sit down seven NU batters. An opening walk in the third inning was all North Union needed to score its runs. Draper credited the win to some solid hitting when it counted. “It was timely hitting again,” she said. “As soon as we got somebody on base, we put the ball down and bunted a bit,” Draper said. Destiny Reebel opened the third with a walk, which allowed the Cats to open their options with Jacklyn Fishbaugh at the plate. Her sacrifice bunt moved Reebel to second and a bunt single by Candace Halloway moved Reeble to third. Halloway advanced to second on an unchallenged steal. Duncan laced a hot shot to short stop that couldn’t be fielded cleanly. Reebel scored and runners were at first and second. Regan Martino moved the runners with a bunt that ended with her safe at first after an error. Madison went to the plate with the bases loaded. She didn’t disappoint as she cleared the paths with a shot to the right-centerfield gap that reached the fence. The Lady Cats took a 4-0 lead at the end of the third. Draper said that a walk to open the inning is always a recipe for success. “We had two great hits from two great hitters,” she said. “That makes a huge difference, plus (Reebel) started the inning with a walk. From there, it was all in the hands of the Lady Cats’ defense. Duncan struck out three of the four hitters she faced in the fourth. She coaxed several ground balls in the fifth with runners pressuring to score, but escaped untouched. A couple of more strikeouts in the sixth and seventh inning was all it took as the Lady Cats marched on to their 12th win of the season. NU will travel to Teays Valley today.